Born of a Kickstarter campaign, Anima: Gate of Memories finally launched back in June of 2016 on PlayStation 4, Xbox One and PC. Now with the new kid on the block – the not so new Nintendo Switch – it’s time for this Action JRPG to finally land on the hybrid console as Anima: Gate of Memories: Arcane Edition compiling the base game and the expanded story known as Anima: The Nameless chronicles with publisher partners BadLand Games. Pulling its lore, universe, and inspiration from Anima role books (Beyond Fantasy), the JRPG might have all the ingredients to appeal to a fan of the series but gaming genre alike. Anima: Gate of Memories takes us to Gaia, a world combining the medieval and fantasy genre, where a society called the Nathaniel has existed for centuries to protect humanity from the forces of darkness. Our two protagonists are part of this group, and the first order we receive from the latter at the beginning of the adventure is to recover an artifact called the Byblos. The latter – other than also being a Lebanese historical city – is an end of world relic, stolen by a renegade you will have to chase down. Players are told that the hunt for the Byblos has been long and that we are finally arriving in a war-ravaged city. It is here that we will find ourselves in the Arcane Tower, a sort of huge labyrinth full of mysteries that will have to be discovered. That labyrinth is a character of its own as well, with numerous parts of its past in the game, told in a pleasant narration that will keep us in suspense throughout the adventure, almost reminding me of the original Nier. Our heroine does not have a name and calls herself the carrier, due to a powerful creature locked in her grimoire which gives her strength. The second character is Ergo Mundus, and this is the ferocious beast that is in the book. The latter can materialize in a human form through the mirror and this is how you will have two fighters and eventually switch from one to the other using a simple press of a button. You’ll soon understand that Ergo was sealed in the book by the Nathaniel because his goal was to destroy the world. If the sets, the environments and the general atmosphere of the game are close to fantasy and immersive, the character design lacks charm and even has a certain incoherence with the rest of the game’s details. Nevertheless, you manage to ignore this point during the numerous gameplay phases, because at the end of the day, it is indeed a Kickstarter funded game and not an AAA title. What matters is this mysterious tower, and that in general, the outdoor scenery is beautiful whether you are in green plains, snowy environments or crossing mountains. To advance in the adventure, you will have to find the memories of important people who have a relationship with this mysterious place where you are stuck. This is done via a series of riddles, which are extremely varied, forcing you to really research and scratch your head to advance. This is where multiple endings come into play because you will not be able to discover every piece of memories, thus, you will have to make choices. Indeed, when it comes to attacking enemies at a distance or when you find yourself in a confined space with more than three or four enemies in melee, there will sometimes be a tendency to be chained and finally die what is a little frustrating. Nevertheless, the automatic backup soothes this feeling since we change very often screen to move from one screen to another and therefore, we often record the game. Moreover, on this subject, the loading times are a bit long because necessarily, even if it is a low-budget title, we are clearly more used to this practice that dates a little. That said, the characters’ control scheme is solid, done with a third-person view, and aided by a possibility to target the enemies and finally, different techniques and skills to chain the opponents with combos. The various attacks you can use are unlocked through a skill tree specific to each hero and they can, for the most part, be improved up to three times. Everything will cost skill points but there will be a minimum level required to unlock more powerful moves which make sense in order to maintain a consistent progression. In addition to the attacks that you will assign to the different keys for your combos, there are also passive abilities and support techniques. The skill tree is divided into several segments and if you activate skills that are on the same line, you will unlock passive bonuses such as increased HP, defense or magic. Nevertheless, we must admit that the two characters have quite similar trees even if there are some variations. In any case, if you choose a long-range magic build for a character and one specialized on melee combat for the other, both roles can be attributed to the carrier as well as to Ergo. Fortunately, and importantly, the Anima: Gate of Memories soundtrack is just beautiful, regardless if it’s a Kickstarter game or not. You will enjoy the melodies while reading the different memories of people populating this world glaucous. That’s no surprise, considering the OST is done by Sonotrigger Studios, a team known for their previous work on indie games like Rise & Shine. 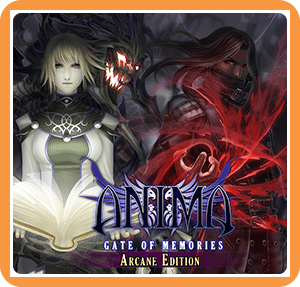 Anima: Gate of Memories: Arcane Edition was reviewed using a Nintendo Switch digital download code provided by BadLand Game. The game is also available on PlayStation 4, Xbox One and PC via digital and retail store releases. We don’t discuss review scores with publishers or developers prior to the review being published (click here for more information about our review policy). Now available on Nintendo Switch as Anima: Gate of Memories: Arcane Edition, this innovative Action JRPG game is full of good intention, great storyline, and solid gameplay even if it's not technically on par with bigger budget games.